Every day, every week, every month of the year, Eclectablog is here, championing progressive causes and holding those in power accountable for their actions. Day after day, the writers here at Eclectablog are providing essential analysis and advocacy, spreading word of the valuable work of progressive activists and groups, and holding elected officials’ feet to the fire. This year, we also added a weekly podcast – “The Sit and Spin Room” – where you can hear the political musings of LOLGOP and Eclectablog along with their weekly guest. We’ve had some amazing interviews with folks like John and Debbie Dingell, DNC Chair Tom Perez, actor Wil Wheaton, and a whole host of other incredible progressives. In return, we come to you, our readers, and ask you to support what we do. Our model, where all regular contributors are paid for their superlative writing, is rare but it’s one that represents our progressive values. What’s even more rare is we do this without bombarding you with ads on the sit or during the podcast. Other than a few items promoting the work of our progressive partners and some unavoidable ads in the Disqus commenting system, Eclectablog is ad-free. No pop-up ads. No autoplay video ads. Nothing to distract you from the great content we provide or to slow down the loading of the page. We come to you asking for money as infrequently as possible and, once a year, we try to do something that’s fun. Out of that idea was born the Eclectafundraiser party. Our fourth annual Eclectafundraiser party will be Friday, May 12, 2017 at the ABC Microbrewery (aka, Corner Brewery, 720 Norris Street) in Ypsilanti from 7-10 p.m. 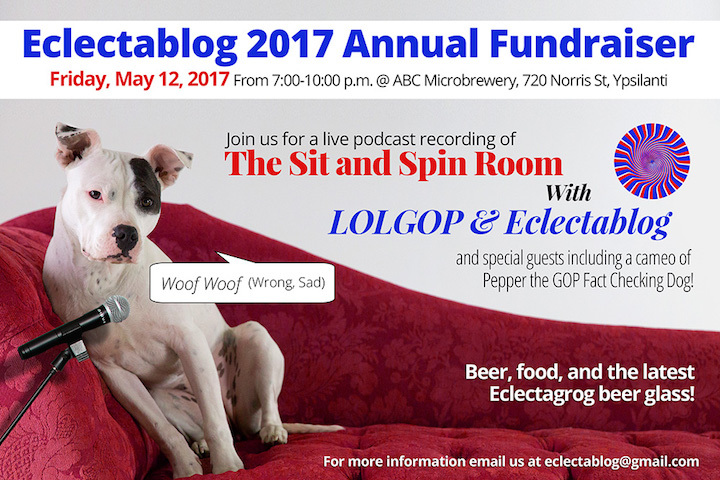 This year, LOLGOP and I will be doing the first live production of our podcast, “The Sit and Spin Room with LOLGOP & Eclectablog”. We have lined up some amazing guests and it’s sure to be a super cool experience. Tickets are $35 at the door. As in previous years, we’ll have a raffle, complementary food & beer, and a limited edition “Eclectagrog” beer glass as a souvenir. Because we are progressives, we won’t turn anyone away at the door who can’t afford the ticket price so, if you can’t make it to the party and/or are feeling progressively generous, please consider donating a ticket to ensure everyone can come. You can do that on the “Eclectablog Sponsorship Payment” page. You can RSVP and stay up on all the news on our Facebook event page HERE. Democracy Defender – $2,500 or more; includes admission for ten people to the party as well as a week of advertising on Eclectablog in our premium ad space. Guardian of Good Government – $1,200; includes admission for eight people to the party as well as a week of advertising in the sidebar space. You can pay for your sponsorship via Paypal or a credit card by clicking HERE. Or you can email me at eclectablog at gmail and arrange to send a check. We hope you will join us May 12th. Like our previous parties, it will be tons of fun! But it’s also a necessary investment in journalism to keep progressive causes in the public eye. So whether you can be with us in person or not, chip in as much as you can to keep Eclectablog serving movements for a fairer future in Michigan. And please help by sharing this message with everyone in the progressive world!